The Essence Series features fully machined particleboard components with dovetail construction. Wood grain patterned melamine provides clean, durable interiors and shelving. Available in five species, this affordable line of component cabinetry offers upgrade options such as flush end panels, four-sided dovetail drawer boxes and extended stiles. Wall cabinets are 12-1/2” deep; heights range from 12” to 42” with over 400 separate skus. Multiple base cabinet configurations are available in 34 -1/2” high and 24” deep. Tall cabinets are available 84”, 90” or 96” tall and 18” or 24” deep in a variety of configurations. 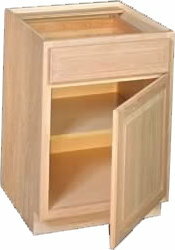 Most Vanity Cabinetry available in 18” or 21” deep and 31-1/2” or 34-1/2” high in over 150 skus. Appliance Cabinetry is available to accommodate most manufacturers’ built-in appliances.